Nandi Mehta takes a penalty kick. 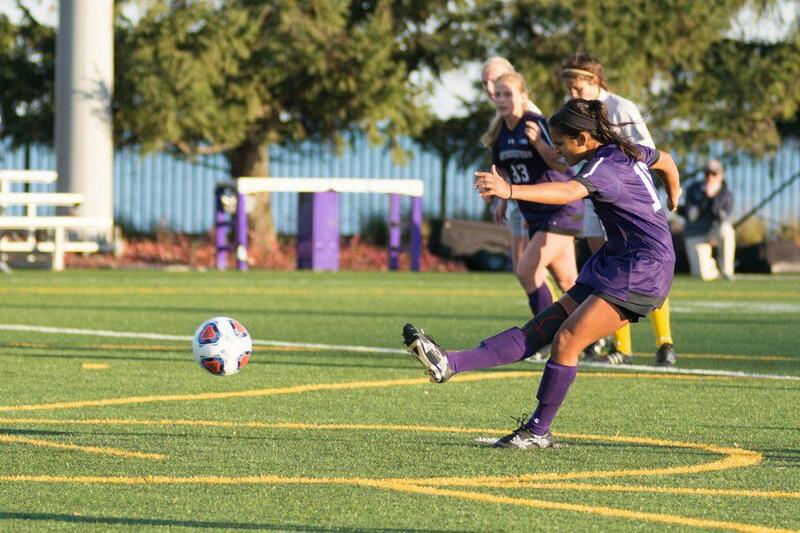 The graduate midfielder scored Northwestern’s second goal in a 3-0 victory over Kent State in the first round of the NCAA Tournament. It took just 18 minutes on Saturday for Northwestern to do what it hadn’t in the Big Ten Tournament: score. As sophomore defender Kayla Sharples headed in a perfectly-placed corner kick from sophomore midfielder Marisa Viggiano, the Wildcats broke a seal that had held them back in the season’s final stretch. The goal gave NU (15-2-4, 7-1-3 Big Ten) a 1-0 lead over Kent State (15-3-2) in the first round of the NCAA Tournament — a lead it would stretch into a 3-0 victory. Just after the opening whistle, it seemed as though the Cats were destined to struggle to finish good looks, as they did in the second half of last week’s Big Ten Tournament semifinal against Rutgers. Five minutes into the game, junior Grace Orndoff missed a clean look off a corner kick that she sent over the crossbar. But NU recovered, converting off Viggiano’s corner in the 18th minute to take the lead. Set pieces have been a strong suit of the Cats’ all season, and Moynihan said the team practiced them heading into the contest in the hopes that they would invigorate NU’s offense. The score sparked life into the Cats, who extended their lead just two minutes later. Orndoff again saw an opportunity to score but was tripped up the Kent State goalie inside the box, prompting a penalty kick. Graduate midfielder Nandi Mehta — described by Moynihan as a “rock” regarding her consistency converting penalties — sent a dart to the top-left corner of the goal as the Cats established a 2-0 lead. The pressure then fell on the back four to guard the lead, a small ask given NU’s reputation as a defensive powerhouse. But coach Michael Moynihan said his team wasn’t content to sit back and absorb pressure after grabbing an early lead. And in the 83rd minute, the team finally notched a goal in open play. Viggiano connected with senior forward Rachel Zampa streaking along the left sideline, who then crossed it to junior midfielder Kassidy Gorman. Gorman redirected the pass to lift the Cats’ lead to 3-0, solidifying the win. NU will face SIU-Edwardsville in Durham, North Carolina, on Friday as it looks to extend its run. To do so, it’ll look to capitalize on the momentum from Saturday’s win. The Cougars enter the second-round hot too, having upset second-seeded Notre Dame to earn its spot in the round of 32. Notre Dame was held scoreless against SIU-Edwardsville, a fate NU knows all too well. But with a strong offensive outing behind them, the Cats are confident in their ability to score goals heading into the next round. “Hopefully we didn’t use them all up,” Moynihan said.